Do you need nail art step by step inspiration? 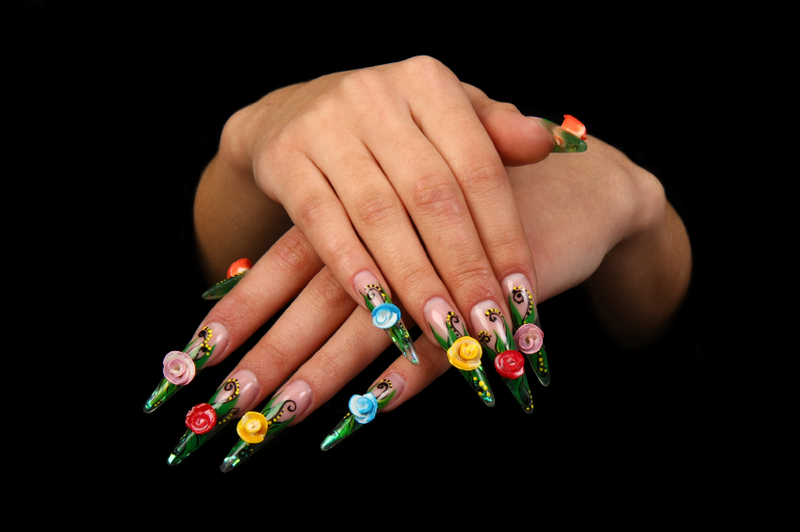 Whether this is your first time creating an artful fingertip or you're a pro just looking for new ideas, you'll find plenty of designs right here. Go ahead and unleash your creative side and use your art to express a bit of your exciting personality right on your fingertips. Before you start applying your colorful art, trim and file nails to desired length. Make sure nail bed is dry before applying any polish. Choose a base paint color for your nail art. This can be any color you choose. While many women opt for a plain neutral hue for a nail art backdrop, vibrant and colorful hues can be appropriate for special occasions or when you want extra drama. Once you've painted your nails, it's time to pick an art design. You can get very creative and intricate, or keep it simple with a few basic flower shapes. Using a thin paintbrush, dapple tip in paint and draw a freehand design. Feel free to explore your inner artist. Don't be afraid to add some drama with nail art. After you've done your initial design, add glitter or additional accents. Work in steps and allow each layer to dry between application. Finish your nail art with a coat of topcoat to seal and protect. For more nail art ideas and how-to, check out our pink nail designs slideshow.